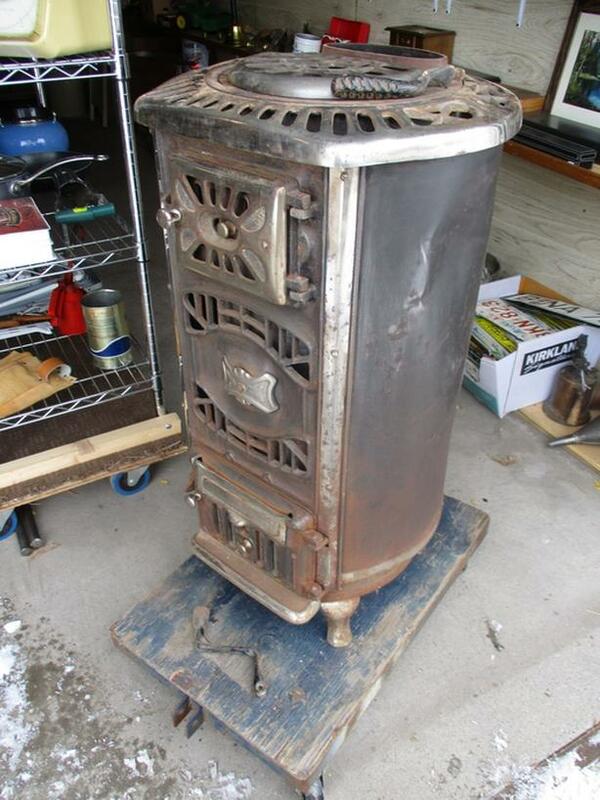 THIS HEATER IS 32 INCHES IN DIAMETER AND 35 1/2 INCHES HIGH. THE BURNING AREA IS BRICK LINED. AT THE TOP BACK IS THE STOVE PIPE EXIT. ON THE TOP ARE TWO REMOVABLE LIDS TO FILL THE FIREBOX. ONE IS LARGER AND WILL SWIVEL OPEN ON A PIVOT. THE LID OPENER IS THERE TOO. OVER THESE TWO LIDS IS A SWIVEL WARMING LID USED USUALLY TO KEEP THE COFFEE POT WARM. AT THE FRONT IS A SWING OPEN DOOR TO ADD COAL OR WOOD. AT THE BOTTOM IS A DOOR COVERING THE REMOVABLE ASH TRAY, A DAMPER AND THE GRATE AXELS. THE GRATE AXEL TURNER IS WITH IT TOO.